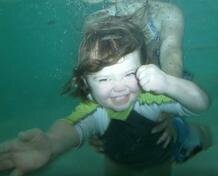 The Baby & Me class is centered around gaining comfort in the water for the 6 month old to 36 month old child. Instead of parents sitting idly by while the class takes place, this is one-on-one time with parent and child. Our Aquababy swimmer level is the intermediate step for children in the Baby & Me class who have completed the skills for that level, but have yet to reach the age of 36 months old. 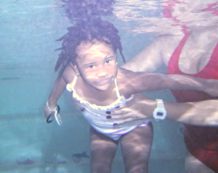 This level introduces independence from the parent, having the certified SSI Baby & Me Swim Teacher performing all of the hands-on teaching in the water while the parent sits in direct supervision on the edge of the pool.